1) What can you serve but not eat? 2) Where do American snakes live? 3) How did the girl hurt herself when she was raking leaves? 4) Which color can talk? Nikhom Buddha, the coordinator of the Wildlife Fun Thailand, Northern Region under the Royal Patronage of Her Majesty the Queen, said that December 26 each year is National Wildlife Day, and this year a seminar and activities were held at Chiang Mai University. Live concert to launch the wildlife preservation campaign. After World War II the numbers of Thai wildlife have decreased sharply due to modern hunting weapons and an increasing number of humans. Thailand enacted legislation to protect and preserve wildlife in December 26, 1961, and the Thai government declared that day to be National Wildlife Day. 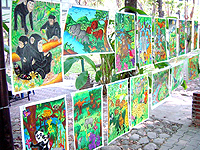 Chiang Mai Regional Forest Office, Department of Forestry, and the Wildlife Fund Thailand held an exhibition at Huay Kaew botanical park, including painting and photo contests, as well as distributing posters, brochures, and leaflets to stimulate people to realize and help conserve the wildlife habitats.